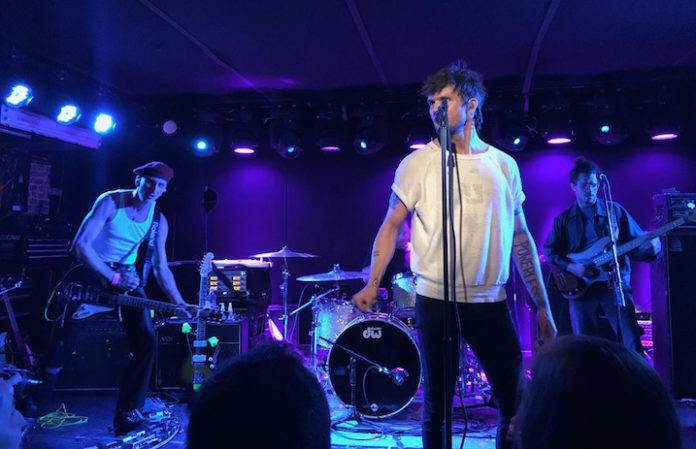 It looks like Boys Like Girls vocalist Martin Johnson has been busy since last year’s 10-year anniversary tour for that band’s 2006 self-titled album. His new outfit, the Night Game, just released a debut single called “The Outfield” (listen below) and are touring this summer with John Mayer. Not quite in the same ballpark as Boys Like Girls’ charming pop rock, the Night Game’s “The Outfield” flaunts a throwback maturity with a solid ’80s backbeat and a chorus reminiscent of classic John Hughes movies. “This song felt like the best introduction to what I’m trying to do and a really good way to segue into the project,” Johnson says in an interview with Billboard. Speaking to NYC Monthly, who deigned the Night Game as “the new pop act with the most exciting frontman since Bruno Mars,” Johnson reveals that Boys Like Girls haven’t exactly broken up—the band members remain good friends. In fact, he doesn’t rule out the possibility of new BLG tunes in the future. For now, Johnson’s focus is evidently on his at-bat in the Night Game. The musician, who has written pop songs for the likes of Avril Lavigne, Taylor Swift and Daughtry, is making the most of his second swing at the plate. The Night Game will play a headlining gig at Baby’s All Right in Brooklyn, NY on May 26 before heading out on their U.S. trek with Mayer this July and August. See the complete list of cities and dates after the track.